This week’s menu features one of my favorite Summer Grilling recipes. I’m also making good use of the zucchini and basil from my garden. 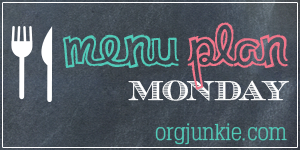 Check out what we’re eating this week. Hanging out poolside while dinner cooks on the grill is what Summer dreams are made of. Get everything ready and prepped before you head outside. Then all you have to do is fire up the grill and throw the food on when it’s time to eat. The Grilled Peaches and Pork on this week’s menu is one of my favorite Summer grilling recipes. It tastes as good as it looks. Grilling the peaches really brings out their delicious sweet flavor.